Archaeologists Jason Shellenhamer and Lisa Kraus, 2015 May 9. 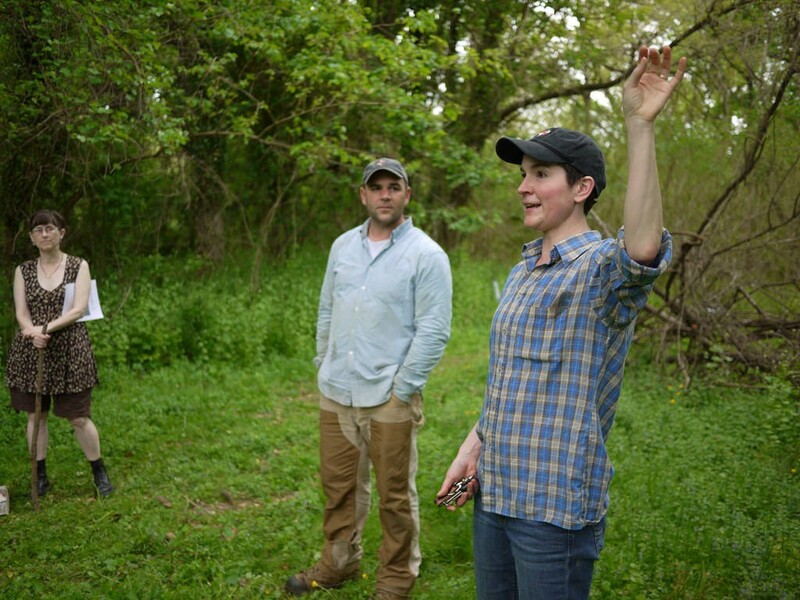 The Herring Run Archaeology Project is volunteer-led public archaeology investigation supported by Baltimore Heritage and the Northeast Baltimore History Roundtable. The project began in 2014 with a survey in Herring Run Park to identify sites related to the Hall Springs Hotel and Ivy Hill Plantation. Our project team is continuing the dig in 2016 with opportunities for local students, residents and volunteers to learn more about archeology and the history of the park. Read updates from the dig on our blog. Archeologist Lisa Kraus has a Ph.D. in Anthropology/Historical Archaeology from the University of Texas at Austin and has worked as an archeologist for the Maryland Environmental Service/Maryland State Highway Administration since 2009. Recent projects include a Phase II study of 18th century taverns in New Market, Maryland, which Dr. Kraus designed and managed. Since 2009, Dr. Kraus has been working with website developers, archaeologists, and the public to create a website devoted to SHA’s archaeological work in Bladensburg, Maryland, relating to the War of 1812. Jason A. Shellenhamer has fifteen years experience in archeology and a Master’s of Applied Anthropology from the University of Maryland. His projects have included archeological survey work at the Chesapeake & Ohio Canal Historic Park, Antietam National Battlefield, Gettysburg National Military Park, and the Peterson House at Ford’s Theatre National Historical Site.